Bertken de Leede is the business advisor of January for the Small Farmers, Big Deal Campaign! She shares with us how in the food sector sustainability programs can lead to rock solid profits. Bertken: “Many tea experts or companies do not even know that Nepal is producing tea. Nepal hosts some of the worlds better tea plantations in my opinion. Why is tea from Nepal so special? It is often cultivated on the slopes of the Himalaya. Most tea that we drink in the Netherlands is cultivated from tropical, lower lying areas. Tea that is grown on a higher altitude, say 1800 to 2000 meter, develops a bit slower. This results in tea with very distinct characteristics. Tea experts are very enthusiastic about the resulting taste. “An example of our work to promote tea export is our cooperation with MAAS, a Dutch coffee and tea machine business. MAAS was interested in sourcing an exclusive tea brand for their premium segment directly from Nepalese farmers. Agriterra connected MAAS to Tinjure tea cooperative in Eastern Nepal. They started their own tea processing two years ago, all by themselves but were quite far removed from regular logistical channels. Without Agriterra, MAAS would have probably never found these organized farmers. 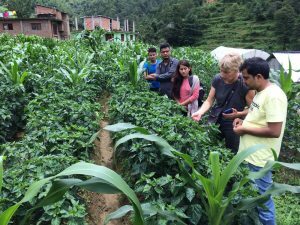 MAAS has a sustainability programme that entails the programme ‘Impact@Origin’, which means they are investing in value addition at the sourcing location in Nepal. After being introduced by Agriterra to the tea cooperative and conducting jointly a company assessment (or audit), MAAS and Agriterra supported this cooperative in improving improve production and their logistic process. This process guarantees the right quality supply and a decent price for the Nepalese tea farmers. MAAS covers the cost for international certification, which is a relatively high investment for the cooperative. Agriterra has facilitated this process, linked MAAS with the right persons and built a connection with the national tea cooperatives federation. Agriterra continues to support the cooperative with training and advisory services. “A company that is looking for sourcing of a specific agricultural commodity can work with Agriterra because of our huge network of cooperatives. We have been in Nepal since 2006, so over a decade. 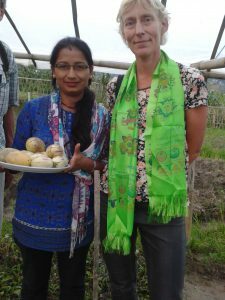 What is relatively unknown about our work is that we visit and are in touch with a lot more cooperatives than those that qualify for a direct partnership with Agriterra. Our entry process is quite strict to enable the growth of the highest quality and most motivated cooperatives. We maintain an extensive registry of those cooperatives that could in the future comply our with standards. And we work with federations of cooperatives, supporting them in providing quality services to the members. Last week, Bertken shared with us why advice and training is often more important for development of local cooperatives than development aid. Next week, Bertken will share some background and tips on doing business in Nepal.